This Jeopardy Nursery Rhyme game is a Favorite! Before the baby shower, print a copy of the game below. 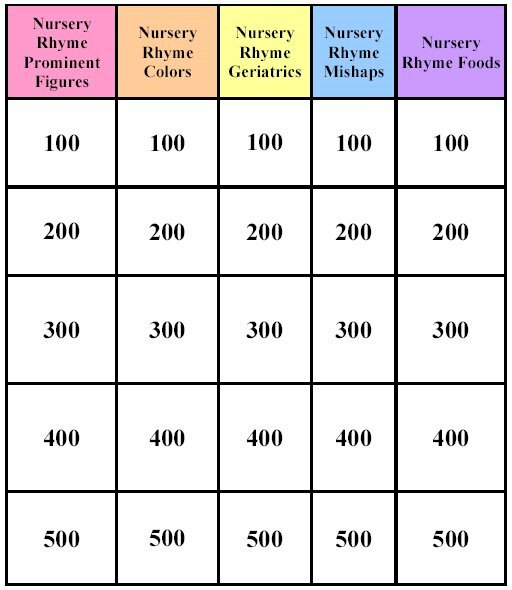 Make a large posterboard of the 5 Nursery Rhyme game categories so they can easily be seen across a room. Basically, you just take the image below and recreate it in larger scale on a posterboard. During the game, have each team roll a dice to see who goes first. The highest rolling team gets to choose a category and has the first opportunity to answer the question. If they get it right, they get to choose another question from the game board. As soon as they get one wrong, the other team gets a chance to answer the question and get the points. Regardless of a right or wrong answer, it is now that team's turn to choose a category for a question. Have someone keep a running total of the points. The team with the most points wins! 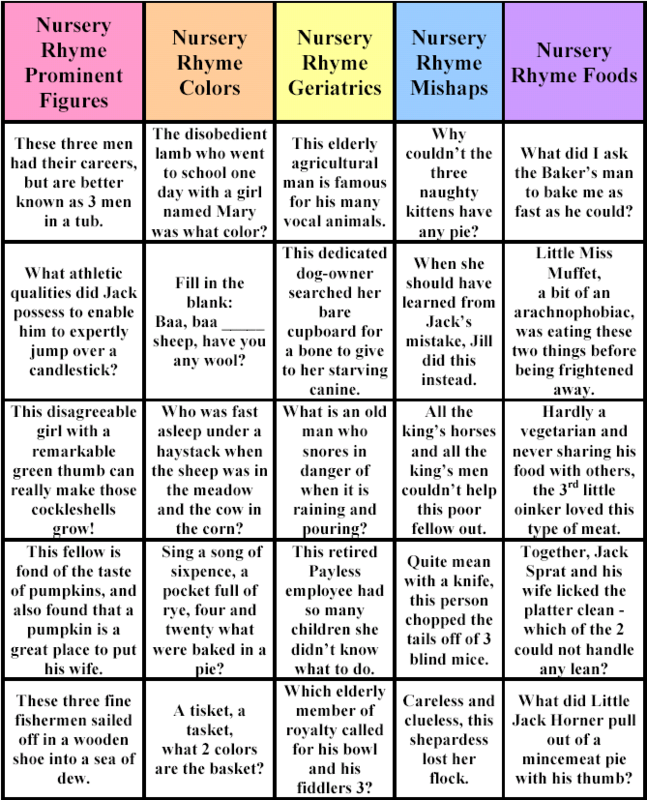 The answers to this nursery rhyme game are below, as well as a copy of each of the nursery rhymes, so you can read them during the game if you want! 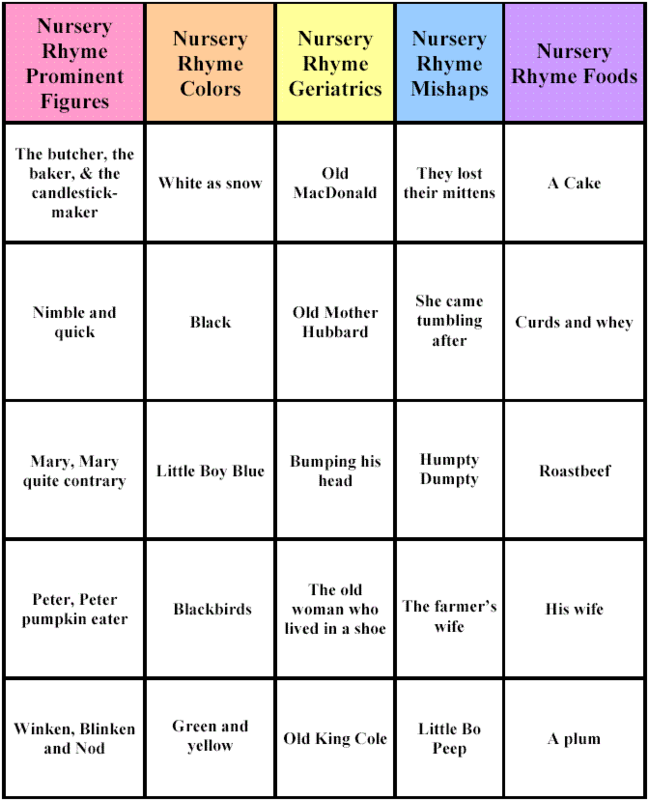 You have several options to print this nursery rhyme game. The EASIEST way to print this game is to open this pdf printable Nursery Rhyme Game and print it from there. Variant: In some versions of this, he is eating a Christmas pie, instead of a mincemeat pie. Roll it, and prick it, and mark it with a "B"
Pat it, and prick it, and mark it with a "T"
Whipped them all soundly, and sent them to bed. And they began to sigh. Our mittens we have washed? Wee, wee, wee, all the way home. And on the way, I dropped it. Jeopardy Nursery Rhyme Game______________________________ Winken, Blinken and Nod by Eugene Field, 1850-1895. found in the Oxford Book of Children's Verse. Enjoy this Nursery Rhyme Game of Jeopardy! !